Stereogum and PopGun are co-presenting a CMJ showcase with Titus Andronicus, Delicate Steve, Chelsea Wolfe, Cuckoo Chaos, Mr. Dream, and Hollerado at Glasslands on October 18. Tickets are $15 with RSVP. PopGun are also co-presenting the True Panther showcase at Glasslands, the Weird Vibes showcase at Cameo on October 20 with Weekend (who also play the BV CMJ showcase @ MHOW), Headless Horseman, Pat Jordache and others, and the Yours Truly showcase at Glasslands on October 21 with Active Child (who also play the BV CMJ showcase @ MHOW), Born Gold, The Stepkids, Memoryhouse, Caveman, Inc., and Ava Luna. PopGun also do their own showcase at Cameo on October 22 with Teen Daze, Art Vs. Science, and others. RSVP is open for all of the showcases. Speaking of Chelsea Wolfe, she’s got other CMJ shows scheduled including Europa on October 19, the Life or Death CMJ showcase at Cake Shop on October 20, a Pendu/Impose showcase at 285 Kent on October 22, and more TBA. She also recently recorded a cover of Nick Cave & the Bad Seeds’ “I Let Love In.” You can download that cover at the top of this post. Chelsea and her band also recently performed for an I-N Session. Check out a video of that performance below. In December, she’ll go on a North American tour with The Black Heart Procession, though that tour unfortunately does not include any East Coast dates. 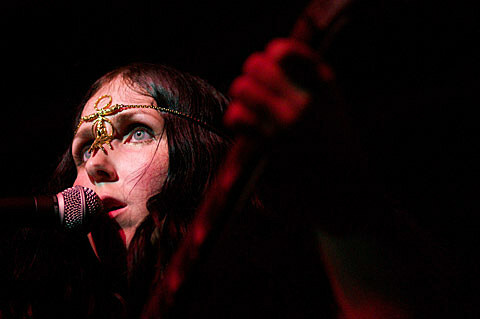 i-N Session w/ Chelsea Wolfe from Anna Dobos on Vimeo.